One option for vintage fine art photography using roll film is the “plate camera”. Although many cameras manufactured between the late 1800s and the 1930s used glass plates, this term is often used specifically to refer to a type of small folding camera, usually in 6×9 or 9×12 cm format, designed specifically to use small glass plates or sheet film. These cameras can be fitted with 120 roll film backs, available on eBay, in place of plate holders. The small plate camera is actually quite an early design, with the first models being produced around 1915 (see the KW post). Production continued into the late 1930s, when glass plates were no longer a popular medium and these models were largely superseded by 35mm and more modern medium format cameras. and author who moved to Paris in 1924, Brassai studied photography under the Hungarian master Andre Kertesz. Wandering the streets of Paris at night with his Bergheil, Brassai captured the beauty of the streets and gardens in rain and mist. 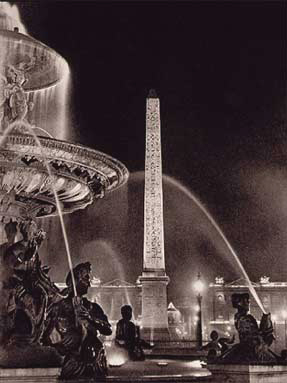 Wikipedia’s entry on Brassai states: ” …he captured the essence of the city in his photographs, publishing his first book of photographs in 1933 titled “Paris de Nuit” (“Paris by Night”). His efforts met with great success, resulting in his being called “the eye of Paris” in an essay by his friend Henry Miller. In addition to photos of the seedier side of Paris, he also provided scenes from the life of the city’s high society, its intellectuals, its ballet, and the grand operas. He photographed many of his great artist friends, including Salvador Dalí, Pablo Picasso, Henri Matisse, Alberto Giacometti, plus many of the prominent writers of his time such as Jean Genet, Henri Michaux and others.” It should be noted that this early work with the Bergheil was done without the benefit of a telephoto or wide angle lens. 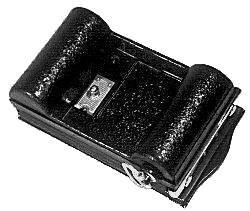 Folded, the Bergheil looks like a small, leather-covered box five to seven inches in maximum dimension, with a leather handle on the top and, in most cases the rear half of a flip-up viewfinder on the left side. Opened, it displays a rear ground glass screen with a fold-out focusing hood. Once the image has been composed and focused on the ground glass, the focusing screen assembly slides upward in its tracks, and can be replaced by a glass plate or sheet film holder, or by a 120 roll film holder. 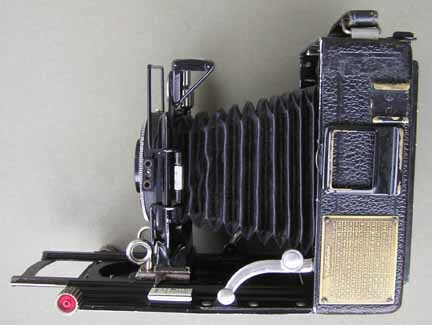 Pressing a concealed button on the top of the camera allows the front plate to flip down, forming the base plate for the focusing rails and exposing the front standard, lens, and bellows. The front standard is usually then pulled out to an infinity stop and locked in place, after which focusing is accomplished using the rack and pinion controlled by the knurled focusing knob at the front of the base plate. The term “Double Extension” is frequently applied to this mechanism, referring to the fact that there are two sets of focusing rails, the upper set attaching the front standard to the upper base plate, while the lower set, equipped with the rack and pinion assembly, moves the upper base plate and lens assembly back and forth on the lower base plate to accomplish fine focusing. 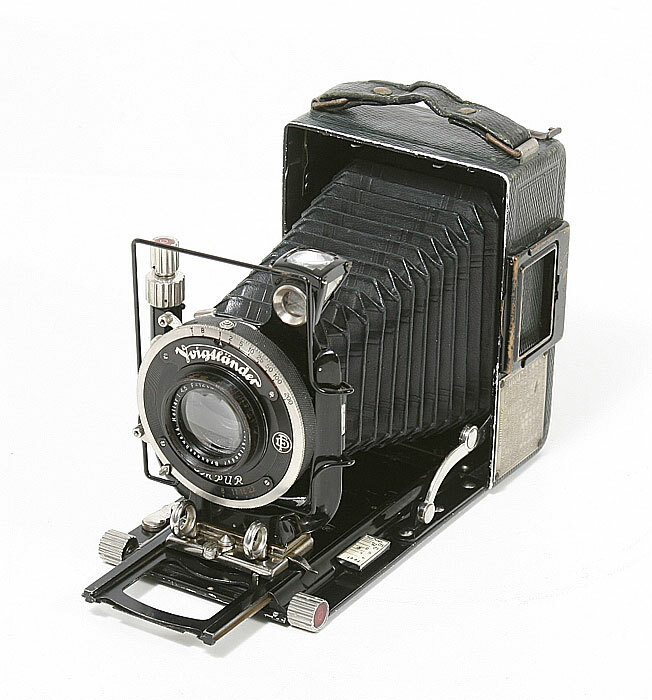 A few models, particularly Agfa plate cameras, are equipped instead with a focusing lever and helical focusing screws incorporated into the front standard, eliminating the need for the lower focusing rail. Most small plate cameras of this era are equipped with thumb screws controlling a small amount of vertical rise and fall and lateral shift of the front standard. Most unfortunate is the fact that there is no vertical tilt or horizontal swing, precluding any use of these movements to allow for greater depth of field. There are no rear movements. Three methods of composing the picture are usually available: a waist level finder, a swing-out wire finder attached to the front standard, and the ground glass focusing screen, the latter being the slowest but most accurate. Most cameras are equipped with a fixed “normal” 100-105 mm lens, with only a few of the higher-end plate cameras having provision for interchangeable lenses. What are the advantages of a small plate camera over the folding cameras discussed to date? The front rise and shift are useful for perspective control when photographing buildings, but are not of significant help in most other settings. Front tilt, of tremendous utility for control of depth of field, is absent. What one does gain is the ability to focus accurately on the ground glass, allowing composition without parallax. Macrophotography can be carried out readily, and close focusing can be evaluated with accuracy. Furthermore, the camera is relatively compact and easy to carry. One significant advantage is that, if more than one film holder is available, one can switch readily between color and black and white film without carrying a second camera body. 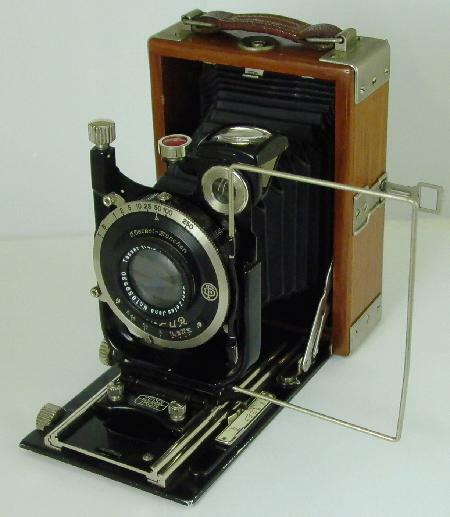 The Bergheil is a classic example of the 1920s small plate camera. However, this format was extremely popular with advanced amateurs and professionals needing a compact, high quality camera. As a result, this type of small plate camera was made in significant numbers by a large number of manufacturers, including Agfa, Zeiss, Kodak, Ihagee and Ica, and there are a large number on the used market on eBay today. Holders for 120 roll film can be purchased separately either on eBay (usually the least expensive option) or from various online stores. These slide into the rear tracks that hold the ground glass and plate holders. After focusing the image on the ground glass, one slides out the ground glass and viewing hood, and slides in the film holder. After positioning the holder, the dark slide on the holder is removed, the exposure is made, and the dark slide is replaced. Using the small red window located under the small sliding door on the back of the holder, the film is advanced, and the next exposure can be made in the same manner. One cautionary note must be made for anyone considering purchasing an Agfa plate camera: Agfa’s famous (or infamous) “Green Grease.” In the 1920s, Agfa lubricated its cameras with a clear grease that worked well at the time, but over the decades reacted with the brass fittings to form a material reminiscent of epoxy resin, efficiently cementing moving parts in place. This can be washed out with diligent use of solvent from reachable elements such as focusing rails, but is extraordinarily difficult to remove from the helical focusing threads used on many Agfa plate cameras. A variety of methods have been proposed for freeing frozen threads gummed up with polymerized deposits of this lubricant: online postings suggest that heat is probably the best option. Wallage, Peter. “Peter’s Plate Camera Page.” Online posting. http://www.peterwallage.com/plate%20cameras.htm. This entry was posted in Selecting a Camera by randcollins. Bookmark the permalink. Thanks for your comment; I’m glad you enjoyed my posting. If you would like a good adventure story about photographic history, you might check out my posting titled “Every Camera Has a Story: KW, the Patent Etui, and John H. Noble.” I took a quick look at your blog, and was sorry to hear that three members of your family are struggling with issues at Christmas. Hi – really great website you have made. I enjoyed reading this posting. I did want to write a comment to tell you that the design of this site is very aesthetically delightful. I used to be a graphic designer, now I am a copy editor in chief for a merchandising firm. I have always enjoyed playing with computing machines and am trying to learn code in my spare time (which there is never enough of lol). Thanks, Jaylin.� I really appreciate your comments, which mean a lot coming from someone who has experience in graphic design.� WordPress is a really nice platform to work from, which gives one a running start. Thank you for your nice comments. I really love doing this, but knowing that others enjoy my writing really makes it worthwhile. iI am soon going to start a running description of the restoration of an old Ansco camera, so keep reading! If only more people could read this.. If only I had a dime for every time I came here.. Incredible read!